Are you sick of pink leopard yet? Cos I’m not and there’s more to come! Social rock and roll is a hot and sweaty affair and freedom of arm movement is paramount, so all of my ball dresses are sleeveless. But the ball is also in winter so a wrap or cover-up is essential between vehicle and venue, and even sometimes when you’re daintily evaporating at the tables between songs. In the past I’ve just used a regular old cardi out of my wardrobe. But really, surely with 11m of pink leopard I could do better? At the time, the WSBN were planning their next sewing challenge and capes were the topic. Mel, Kat, and Juliet debuted their capes, using the free online Peppermint pattern (scroll down the linked page to find the pattern), and Eureka! A cape was just the deal! I’m going to cut to the chase, for once. I didn’t get it made it time. It was soooo close, but I had to let it go. 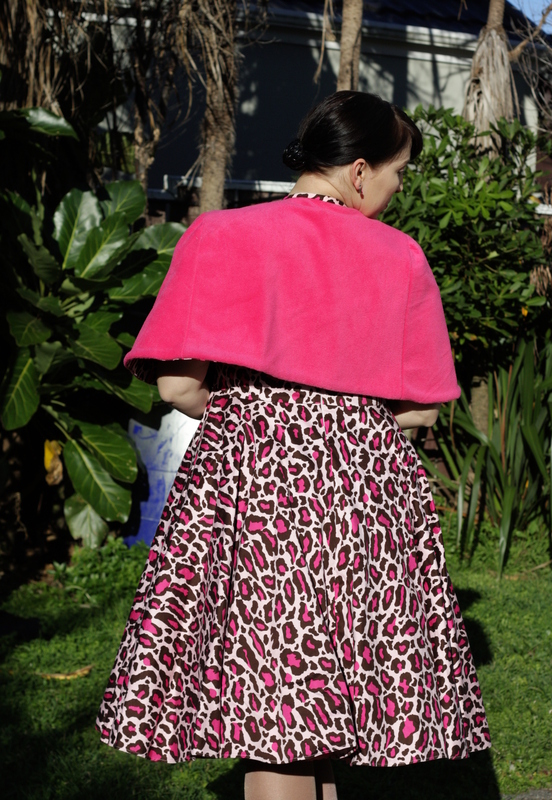 But I returned to the project after the ball and finished my pink leopard cape. Check it out! 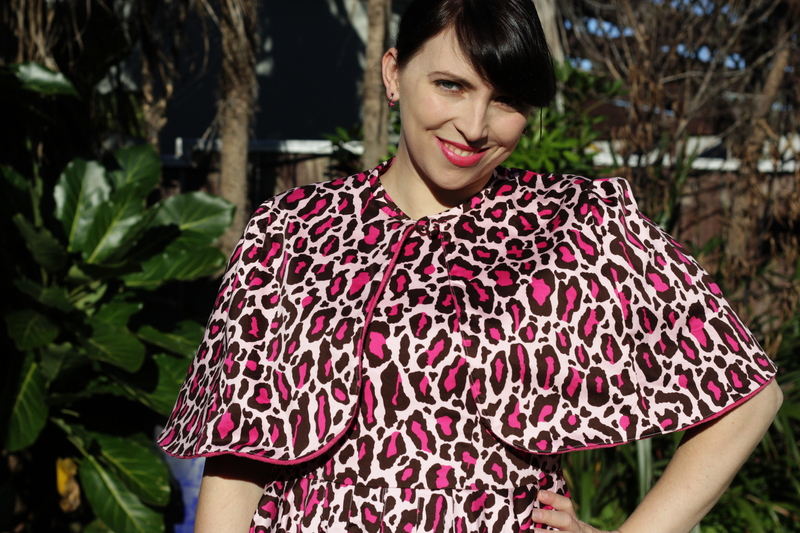 Practical pink leopard cape. Ok, maybe practical is pushing it! The Peppermint Cape is super easy to make. My only real issue with it is the sizing. It’s multi-sized, yay! But I could find no information on what people sizes each pattern size was meant to represent. It’s Aussie based so I assumed the sizes were similar to RTW and then assumed that Aussie RTW was similar to NZ RTW so cut the 14. It’s perfectly acceptable but I do wonder if it’s a tad loose around the elbows. But never mind. 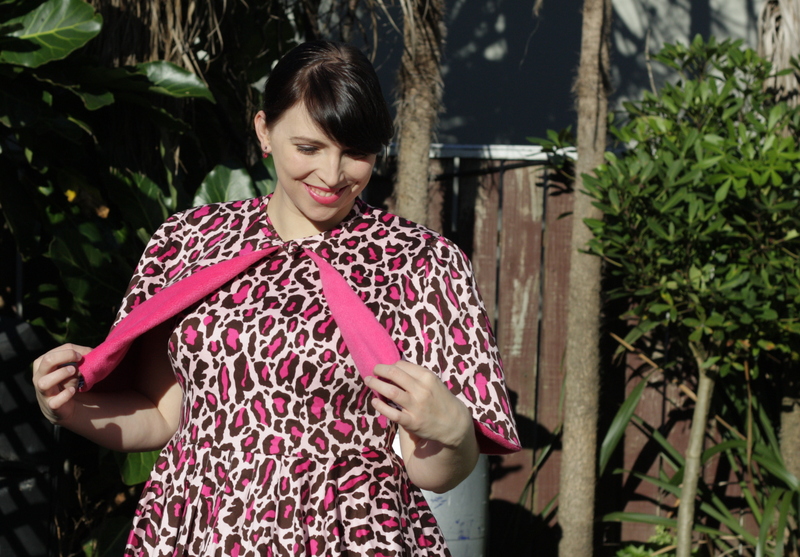 As demure as it gets in pink leopard. I also found it impossible to ease the shoulder caps in without gathers, but that could be my choice of fabric. But I decided I liked the gathers so that was an easy solution anyway. The one part I agonised over for ages was the closure. I’d seen a nifty RTW trick that had a fake frog closure made from buttons. A button is sewn either side of the opening, and the tails of a loop of ribbon are caught under one button. The loop then slips on and off the other button. But try as I might, none of the buttons in my stash worked, and none of the ones I bought to try worked either. What to do? My solution had a roundabout way of arriving. The neck of the cape is bound with self bias. In order to use the scraps (afterall, I only have another 8 metres so I need to be stingy), I had to piece the binding. One joined, my final length of bias was much longer than needed, so I positioned it on the cape so the join was at the back, leaving the raw excess hanging at the front. I used this to tie the cape in place one day and realised this was my solution! But on closer examination, one end wasn’t quite long enough to use for a neat and tidy bow. Determined to use the ends somehow, I canvassed for opinions and a genius friend (which one I can’t remember) suggested making a Chinese ball out of it! Brilliant! So I hand sewed the raw edges of the bias together to make tie ends, mangled one piece into something approximating a Chinese ball, and turned the other end into a loop. Perfect. Except you can’t see it clearly in the photos. Sorry. I kinda like the silhouette of the wide cape across the elbows, much to my surprise! 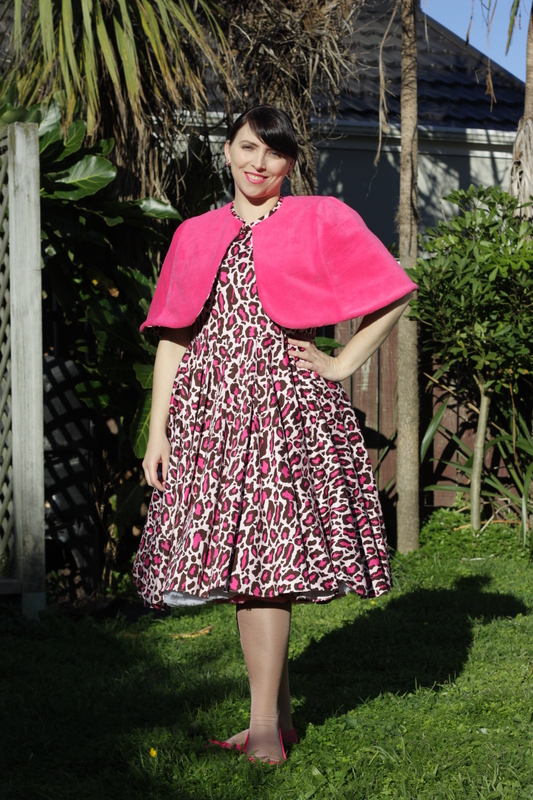 I decided to line it with polar fleece to give it some warmth and softness against my Wellington-wind exposed arms, and found the perfect pink fleece at Arthur Toye. Fuzzy wuzzy hot pink lining! Although unintentional, one of the great things about this cape is that it is reversible! For when pink leopard on pink leopard is too much. Oh yes, much more toned down. And what does one do with leftover scraps of hot pink polar fleece? Put it on the couch for Minerva to sleep on of course! The other thing that rock and roll needs is petticoats. My collection has increased since I made my first one with MrsC! But this is my only white petticoat and started life as two hand-made petticoats. Not an apron, but my white sparkly petticoat, layered over a locally made pink one. I don’t have much to say about the construction that MrsC hasn’t already covered. But I do have some tales, of course! It wouldn’t be me without them! Almost immediately after making that first black petticoat I decided I needed a white one to wear with my pink and white skirt. And a blue one and a purple one and a pink one. So I went to Fabric Warehouse, found a huge roll of white nylon tricot (which apparently dyes really easily), discovered it was hugely reduced (as in, under $3/m) and bought 36 metres! It puts my 11 metres of pink leopard to shame. And I have yet to make more than this one petticoat out of it! But I did make one, a simple single frilled one using a worn white sheet fine white cotton for the yoke. In the black one we stitched the yoke of the petticoat onto a straight slip in a far more robust knit, and turned the edge of the slip to make a casing. But the yoke in my was one much curvier than the top of the straight slip, and in such a thin fabric my attempt to turn it under to make a casing was… unsuccessful. I also had no white elastic! However, I was making it in anticipation of a dance competition that was, of course, only days away so I gave up, plunged on, and stitched the yoke straight to the elastic in the ugliest way possible. Ladies and gentlemen, it is always good to have a friend of dubious taste to offload your tacky stuff to. I am that friend. Having got it shortly before the competition I made another petticoat out of this, but I had now run completely out of elastic so I threw a casing on it and added a drawstring! And then I competed in these petticoats, complete with ugly elastic, drawstring and safety-pin. They went into my good-intentions pile shortly after that, where they languished. But one day my fantastic friend The Sewphist was over at a craft day and had run out of tasks and asked if I had anything she could help with. The petticoats had risen to near the top of the pile, so I fished them out and she fixed them by stitching them both onto a single rectangular intact casing and inserting white elastic! So now I have a single white petticoat, two layers, soft tricot underneath and sparkly tulle on top, and when I dance the sequins glitter as my skirts twirl. It doesn’t get any better than that! Unless it is this outtake. I don’t even know what I was trying to do here, except make an idiot of myself? But I’m entertained and I thought you might be too!